It is an extremely flexible and customizable piece of software - the same tool can be deployed for writers, freelance journalists or correspondents to harmonize data sent to editors from anywhere. 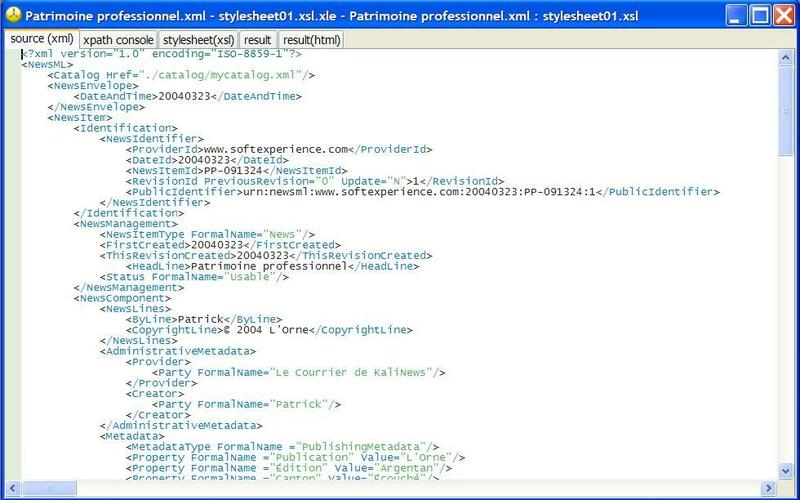 Use of public and documented XML formats to store stories and also the configuration of the software. Flexible and customizable interface: only one XML configuration file to completely handle all functionalities available for the writer, menus and messages definition. Personalization or translation of the software is thus very easy. Automatic update of the configuration on remote client workstations by checking the XML configuration file. Five possible views for a story: information and synthetic view, integral story, text zoom, photos associated with a story, teleprompter. Management of information associated to the story (metadata): date and/or publication number, edition, heading, sub-heading, associated forms, classification plan(taxonomy) , keywords nomenclatures. Control of authorized text elements and photos associated with the story according to form types. Characters counters foreach text element, characters and words counter for selected text. Using an integrated FTP client - possibility to send articles to several FTP servers; transmission of several articles with attached photos within the same operation and update of a sending log. Provides a log of articles and photos sent to editors. Integrated editorial workflow (workflow on a file server) using individual baskets and baskets by service: individual sending, sending to the service, reception, interception. Text attributes and formatting: bold, italics, underline, superscript, multiple subtitles. Notes presented as bookmarks inside story text. Ability to run external applications. Ability to run Internet contextual search: searching synonyms, searching on Google for example. Direct import of RTF and Word files (Word required). 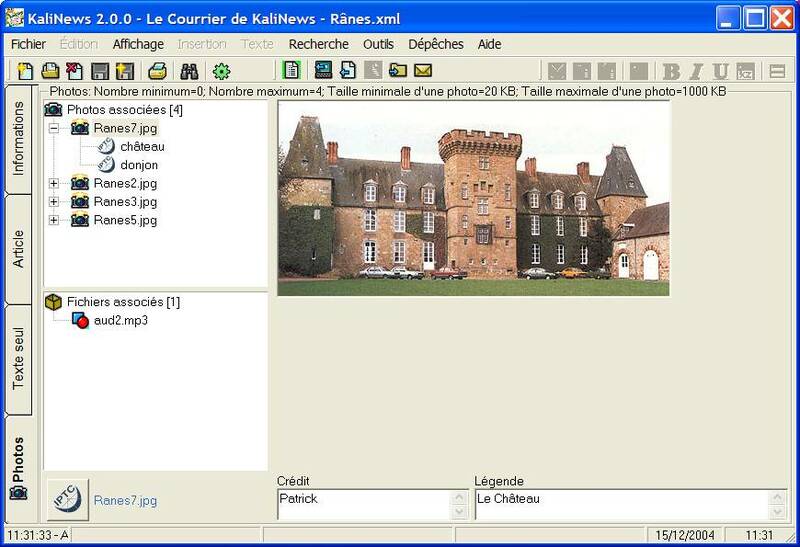 Automatic filling of Caption and Credit fields from corresponding IPTC fields of photos used in the story. Automatic indexation of IPTC keywords from attached photos. Tips of the day to help learning and use the software. Direct export of story to RTF or PDF format (see example on KaliNews FAQ ). HTML and XSL-FO exports integrated using XSL transformations. Exports to prepress formats: NewsML , NITF, InDesign (tagged text), XPress (tagged text), RSS 2.0 or to other specialized editorial systems. Possibility to directly store XML/NewsML/NITF documents in native XML database Ixiasoft TextML to manage document versions, search documents, publish to Web, etc. 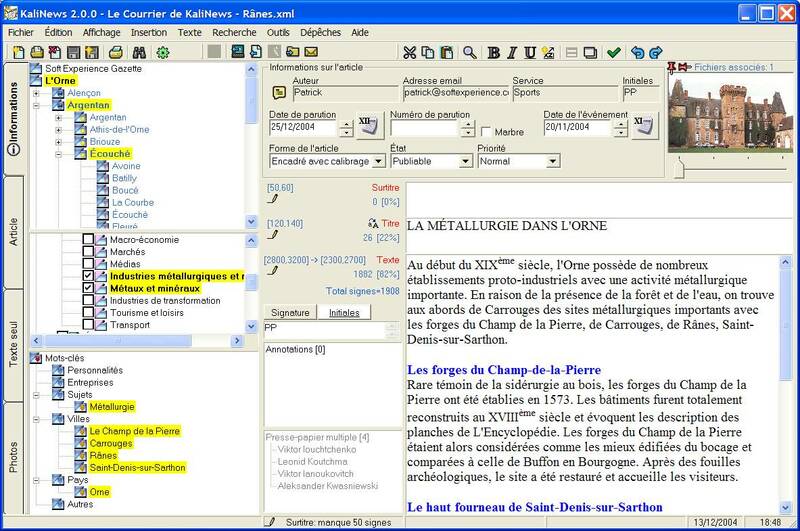 KaliNews 2.06 uses Microsoft MSXML 4.0 parser.